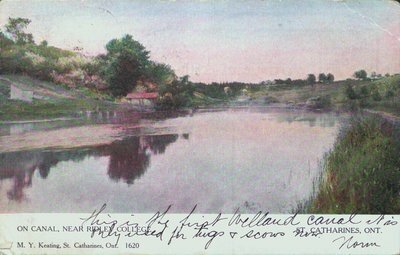 A postcard of a picturesque view of the First Welland Canal, near Ridley College, St. Catharines, Ontario. Postmarked September 1905. On Canal, Near Ridley College St. Catharines, Ont. M.Y. Keating, St. Catharines, Ont. "This is the first Welland Canal It is only used for tugs and Scows now. Norm."